While the need to restore your Nokia Lumia firmware is a rare event, there are times where you may need or want to do so. It could be that your Lumia is stuck during an over-the-air (OTA) upgrade and you have had spinning gears on your Windows Phone for hours. Or, more likely, you have been using the Microsoft Developer Preview to check out Lumia Cyan and Windows Phone 8.1 and need to revert back to get the update that has now been released on for your phone. Regardless of the reason, Nokia has actually made it quite easy for you to restore your Lumia’s firmware and in this How To I’ll show you what you need and how to do it. For those of you who run Macs, there is no Mac version of the recovery tool. However in my testing and restoring of my Lumia 520, I had no problem running the application in a Windows 7 VMWare Fusion environment. It’s not officially supported so it worked for me (and no, I’m not technical support if you can’t get it running! 🙂 ). Before the Recovery Tool does the restore, you will be prompted to back up your device. If you can do it, this is easily done by going to Settings>Backup on your Windows Phone. If your phone is in a state that doesn’t allow a backup to happen (spinning gears), I’m sorry to say you will have to restore all your apps after the firmware update is complete manually. 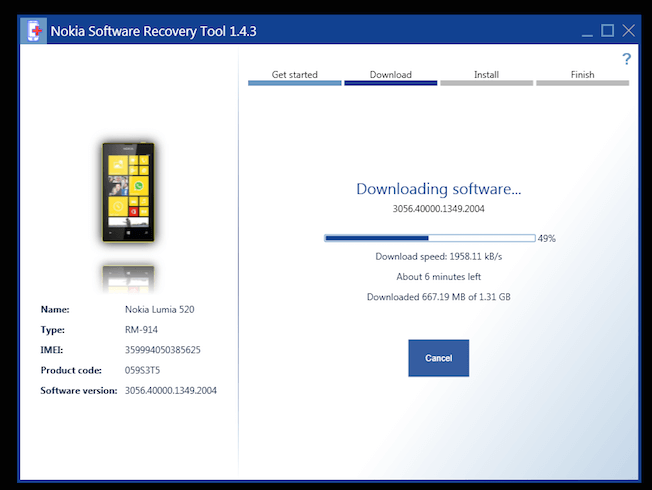 When you click Next the Recovery Tool begins a two stage progress of downloading the Nokia Lumia firmware for your Windows Phone then, once complete, installing that firmware to your device. If you were able to do a backup of your phone, when you sign into your Windows Phone with your Microsoft account, you will be prompted on if you want to restore from that backup or start fresh on your Windows Phone. If you chose to do the restore, it will download the data and apps that were on your device and restore them. The only thing that wasn’t restored on my device was my Home screen layout. I recently used this process to restore my Lumia 520 from the Developer Preview of Windows Phone 8.1 back to Lumia Black. All told, from backup to restore it took me about 30 minutes. Not bad considering what I was doing and there was virtually no user intervention in the process. Once you start the process the software and your Lumia pretty much do all the work. Have a tip or trick? I’d love to hear from you & share it with the community (with full credit to you of course!). Just use the Contact page to share. Thanks for the How To! I was having problems with my 521 on the dev channel. No problem! Glad to help & glad that you found the article useful. Thanks for visiting and reading the site. “Unable to find a bootable option” and Recover Tools Software does not recognize my phone. nor the Hard Reset key combinations work. What did I do in this case? Doesn’t sound good. Did you lose power to the phone during the update? It sounds bricked. i have the same problem, mine is 620 lumia. haven’t tried the recovery tool yet (couldnt find windows comp) is this rare case on nokia? since the service centre in Indonesia never find it before and dont have any idea when i consult on phone.